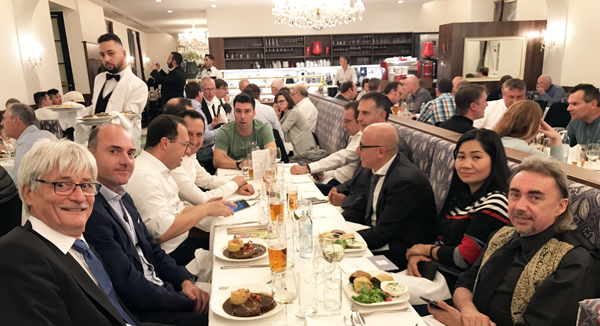 The annual KNX Annual Conference for Training Centres took place on October 16th at the Höhere Technische Bundeslehr- und Versuchsanstalt (Htbluva or HTL) school in St. Pölten, a 30-minute drive from the Schönbrunn Palace where the group met the evening before for a tour, dinner and a concert. Meeting at the Schönbrunn Palace. 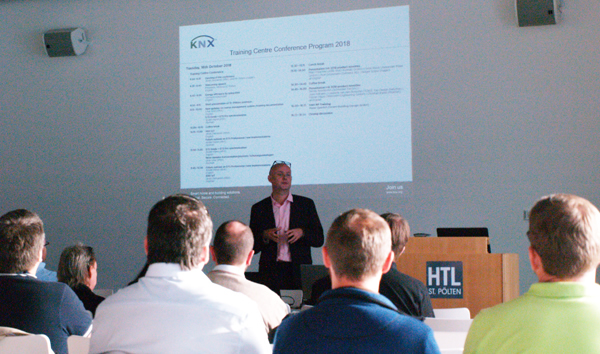 Over 60 people attended from over 50 KNX training centres, representing 80% of KNX training centres worldwide. Most were from Europe, but there were also representatives from North Africa, the Middle East and Asia. The programme included presentations on KNX training centre issues, KNX technology, applications, demonstrations and some hands-on training. Students from the HTL helping with the registration process. The conference began with KNX Certification Manager, Ufuk Unal, going through the updates that have been made to the MyKNX Training Centre Management Tool and the training documentation this year. He also outlined the proposed updates for 2019. 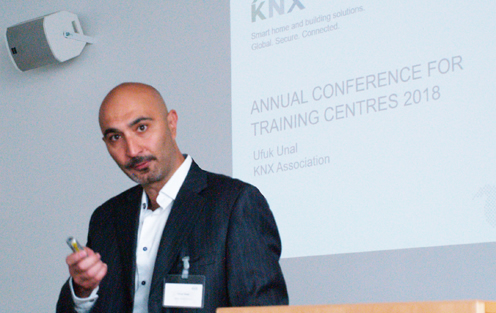 KNX Certification Manager, Ufuk Unal. i) To prevent photographing the exam results, the student will no longer get a summary of the correct/incorrect answers in green/red after the exam; they will only see the achieved score. ii) If there are statements that ALL students got wrong in the exam, these will be listed as a single PDF document in the MyKNX account of the KNX tutor for him/her to (better) explain. To run the KNX Advanced Course – you must have trained 50 KNX Partners. 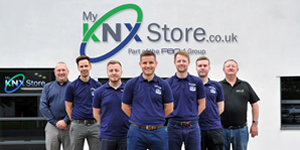 To run the KNX Tutor course – you must have trained 25 KNX Advanced Partners. iv) Foreign students can now take the exam in another language using the drop down tool. v) KNX.org wants to reduce the number of ‘Personal’ MyKNX accounts that are used by Training Centres and move them to ‘Professional’ (Official Training Centre) accounts. The thinking is that this will make sharing licenses, invoices, offers and orders within your organisation easier. vi) Ambiguously-phrased statements: there are approximately 25-30 statements/questions that are consistently answered incorrectly. i.e. they have a failure rate of >50 % in all languages. These statements will be tackled in Q1/2019. vii) The Stock License procedure has been improved, although the logic behind this and the new process remain unclear to me. Attendees being informed about the changes to the MyKNX Training Centre Management Tool. i) DALI information has been added to the ‘Lighting Control’ chapter. 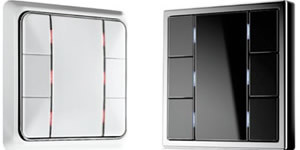 As of next year, it will become mandatory to have one DALI gateway per training rig, in order to provide KNX Advanced Courses. ii) M-Bus information has been added to ‘KNX and Smart Metering’ chapter. iii) The HVAC Specialist course was introduced in May 2018. It is a 12-hour course with a theory exam only. This course is intended for KNX Partners only. i) Chapter ‘Bus devices’ – basic build-up of a KNX device is sufficient, remove in-depth info with regard to the internal structure of a transceiver. Q1/2019. ii) Chapter ‘System arguments’ – showing the true benefits of KNX (one single configuration tool, backward compatibility, advantages compared to other bus systems…) and mention KNX Secure. Q1/2019. iii) Chapter ‘Telegram’ – this chapter plus all theoretical exam statements will be moved to the Advanced Course. 01/2019. iv) Points allocation in the Basic Course practical exam – more points will be given to the creation and assignment of the bus topology. 01/2019. 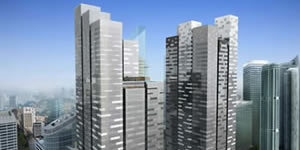 v) Chapter ‘Visualisation’ of the KNX Advanced Course – OPC related info to be added. 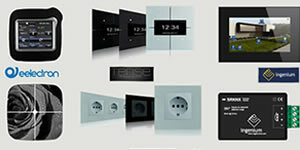 vi) Chapter ‘KNX Secure’ – already available in German but needs fine-tuning before it can be translated into English. This chapter will become part of the KNX Advanced Course. vii) Chapter ‘IP communication’ from the Tutor Course and all the theoretical exam statements will be moved to the KNX Advanced Course in 01/2019. As a result, a short theory exam of 20 questions will be added to the Advanced Course incorporating statements from chapter Telegram (Basic Course) and chapter IP communication (Tutor Course). 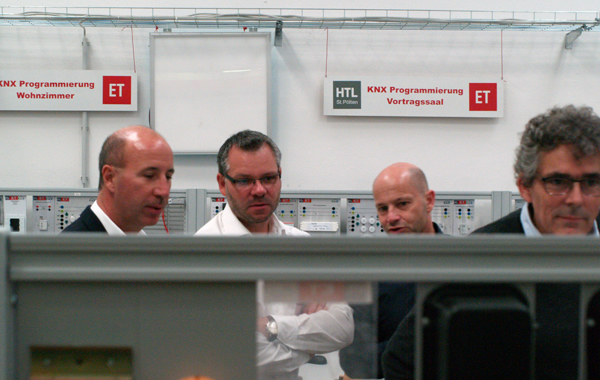 A tour of the HTL’s KNX training labs. This forum is Intended to act as a proactive working group of KNX tutors to help monitor/improve the exam statements and provide feedback to KNX.org and guidance for local-territory training centres. Let me, Julian Barkes, know if you’d like to put yourself forward or get involved. Every upgrade you generate from ETS5 Lite to ETS5 Pro, the lower your annual fee. Each Training Centre will get a credit for each student who upgrades from ETS5 Lite to ETS5 Pro, capped at a maximum 50 upgrades per year. A new webinar will be developed for KNX tutors to keep them better informed of enhancements/changes as they are made. It is intended that each tutor will adapt each PowerPoint (PPT) presentation into more user-friendly local language to improve the effectiveness of the communication. KNX.org wants training centres to use/engage with the GoToTraining Platform more. There was time to network and socialise during the event. Following a presentation that focussed on the training centre and how it uses KNX to save energy, Joost Demarest, CTO of KNX Association, summarised the challenges that lie ahead for KNX IoT and the opportunities there are for KNX IoT. KNX Association CTO, Joost Demarest, talking on KNX IoT. André Hänel, Tool Manager of KNX Association, then showed the new ETS Inside updates and gave a live demonstration on Project Transfer and Restore Points/Backup. In the second part of his presentation, he disclosed the future implementations that are planned for ETS. 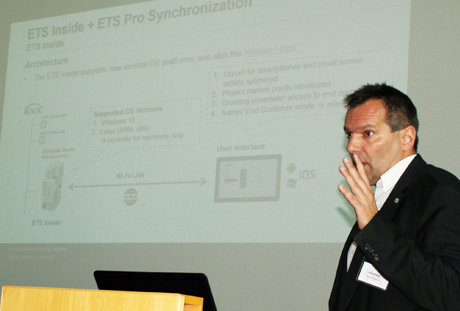 KNX Association Tool Manager, André Hänel, presenting ETS Inside updates. In the afternoon, eight manufacturers, namely ABB, Alexander Maier, Siemens, Hager, Schneider, Tense, Weinzierl and ProKNX presented some of their new products from the Light + Building 2018 show. To download the individual presentations, click here. The KNX Annual Conference for Training Centres is just one of the activities that the KNX Association undertakes in order to promote the advancement of the KNX standard and the success of those who participate in it. It was well worth attending. We learned a lot, had the opportunity to provide feedback and were able to network with others in a delightful environment. Julian Barkes is a Director of Bemco, a major supplier of quality electrical products for over 100 years. 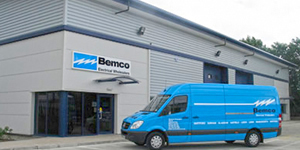 Bemco offers regular KNX training from its London offices at Wandsworth Bridge.